" I tore through this book with heedless pleasure." When her daughter Bee claims a family trip to Antarctica as a reward for perfect grades, Bernadette, a fiercely intelligent shut-in, throws herself into preparations for the trip. But worn down by years of trying to live the Seattle life she never wanted, Ms. Fox is on the brink of a meltdown. And after a school fundraiser goes disastrously awry at her hands, she disappears, leaving her family to pick up the pieces. Which is exactly what Bee does, weaving together an elaborate web of emails, invoices, and school memos that reveals a secret past Bernadette has been hiding for decades. 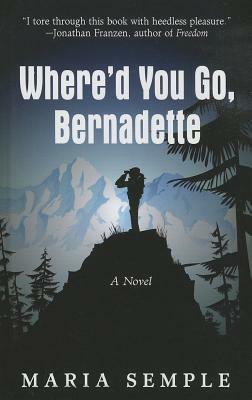 "Where'd You Go Bernadette" is an ingenious and unabashedly entertaining novel about a family coming to terms with who they are, and the power of a daughter's love for her mother. Maria Semple's first novel, This One is Mine, was set in Los Angeles, where she also wrote for television shows including "Arrested Development," "Mad About You," and "Ellen." She escaped from Los Angeles and lives with her family in Seattle, where her second novel takes place.